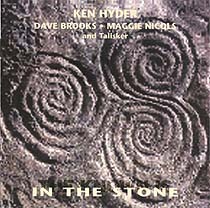 Ken Hyder, drums; Dave Brooks, bagpipes (tracks 1, 3, 5, 7, 9); Maggie Nicols, voice (tracks 2, 4, 6, 8); Talisker (track 10): KH, drums; Maggie Nicols, voice; Pete McPhail, low whistle; Don Paterson, guitar; Marcio Mattos, bass). Tracks with Dave Brooks recorded at Barefoot Studio, London; tracks with Maggie Nichols recorded at Oor Wullie Studio, London. No recording date is given but, according to Ken Hyder, both duos were recorded 'two or three years ago', i.e. 1997/1998. The Talisker track is 'maybe sometime in the mid/early 1980s'. Artwork and design (front cover reproduced above) by Impetus.